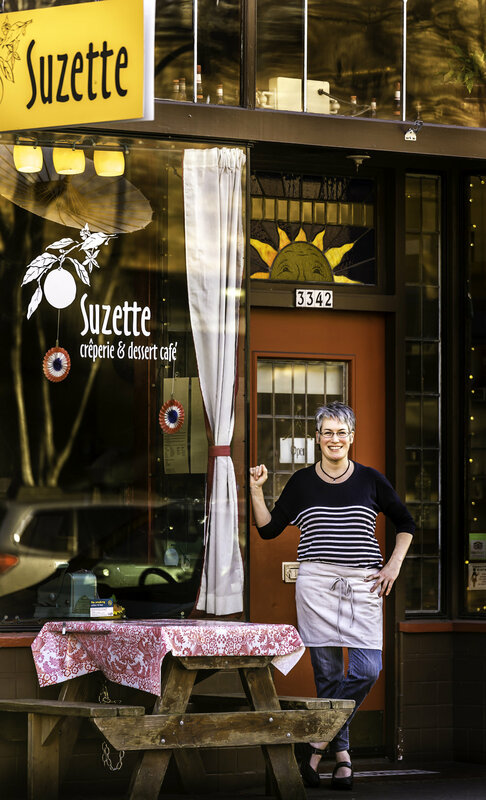 Suzette is a crêperie and dessert cafe, founded by accomplished pastry chef and native Portlander Jehnee Rains in 2009 as a food cart on Alberta St. By 2012, Suzette was ready to set down roots at the current brick and mortar restaurant space on Belmont St. It all began after Jehnee earned her art degree at Reed College and moved to the Bay Area to further study painting—but within 6 months she had jumped from canvas to kitchen. Jehnee became a 4 a.m. pie baker in 1994, over the next 11 years she headed pastry departments at some of the Bay Area’s finest restaurants, including Quince in San Francisco and Chez Panisse in Berkeley – where she wrote the recipe for Crêpes Suzette in the Chez Panisse Fruit cookbook.. After returning to Portland in 2005, Jehnee created desserts for Ripe, Bluehour, and Clarklewis before opening Suzette. Time away from the kitchen is spent hiking Mt. Tabor and putzing in the garden. Her berries, cherries, and figs; lavender, rose geranium, lemon verbena, veggies and flowers are faithfully guarded by three crazy cats against any violent weed removal. Adam, her faithful recipe tester, bartender, waiter, dishwasher, photographer, electronics specialist, and husband, easily distracts them with anything that moves in the grass. It all adds up to the dream Jehnee has been creating all these years: mixing her experiences as 4 a.m. pie baker, pastry chef and organic gardener, Jehnee perfected the recipe for Suzette, born in September 2009.